The male swan is tending his baby chick as a single father. 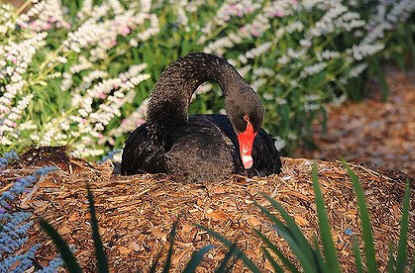 He is also capable of hatching and rearing the single cygnet, and therefore he may not decide to leave the nest. A black swan whose mate was murdered by hooligans [early April 2011] is surprising experts with his devotion to his chick. After the swan’s mate was stoned to death at Queens Park in Melbourne, Australia, people at the Royal SPCA and the Melbourne Zoo were expecting him to have to give up sitting on the egg if he were to have time to feed himself. So the plan was to wait for him to abandon the egg, and then quickly take it to an incubator at the zoo. But the swan has been taking very short trips to the lake for food. And as long as he’s coping as a single father, zoo officials say it would be a mistake to interfere. “Council has been informed that it could be extremely detrimental and stressful for the surviving male swan to try and take the egg prematurely,” said Commander Sipek of the Victoria Police, who are keeping an eye on the swan’s wellbeing. Meanwhile, police are continuing their investigations into the death of the female swan. Four boys are said to have been involved.